Every so often I like to share a few of our favourites here, predominantly Alexander's favourites, as a way of recording what he is interested in. Of course, as with anyone, Alexander's interests are going to change over time and being able to look back on them and seeing how he has evolved in years to come is going to be pretty interesting for me as mummy. Whilst these posts are like records for me, I hope that they provide inspiration for readers in some way or other. 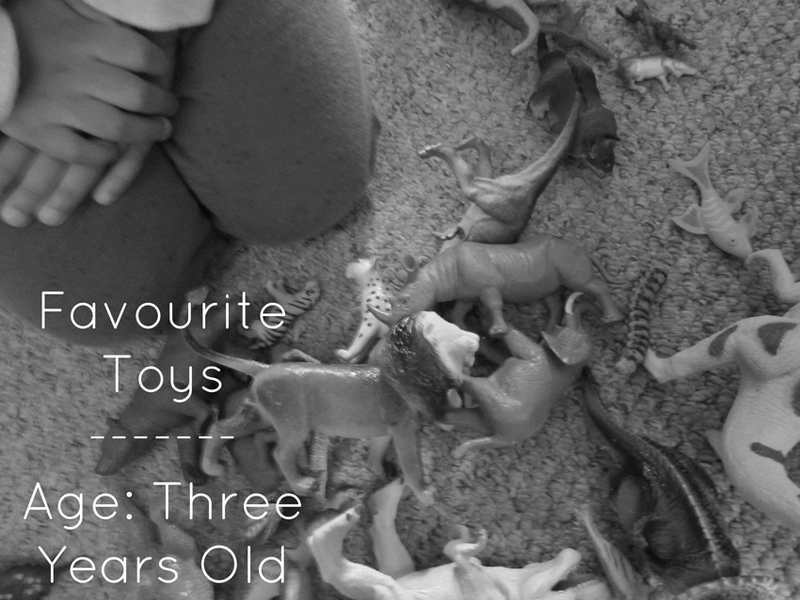 Today I'm sharing about what is possibly a child's favourite thing - toys! Alexander is dinosaur mad, and has been for quite some time now. He enjoys books, films, shows and toys that all heavily feature dinosaurs, as well as knowing the correct names of a vast number of dinosaurs. One of Alexander's favourite things to play with is his collection of plastic dinosaur figures. Although he has a bunch of other animal figures to play with also, you'll largely find him with the dinosaurs. He acts out little skits with them and he also lines them up into families (there is a daddy, mummy and Alexander dinosaur family), which is the cutest thing. We also have a really nice little toy storage box for Alexander's vast number of dinosaur figures, but what makes the box extra nice is that it has a dual purpose - whilst we can store all the dinos in there when not being played with, you only need to pull four zips and you have yourself a dinosaur terrain play mat. Much like dinosaurs, Alexander has been all about the modes of transport for quite some time, although he does go through phases of which type of vehicle is preferred at a given time. He was car mad for AGES, and whilst he does still enjoy playing with them, it is all about the trains at the moment. In particular, Alexander really enjoys playing with his Thomas Take-n-Play trains and tracks. Alexander is Thomas mad! He can name pretty much all the trains - I even get confused on some of them - as well as various parts on a train also. Alexander loves to be helpful, and one way he tries to do this is through his role play toys - Alexander has a toy washing machine as well a toy cleaning trolley that comes complete with hoover, broom, mop & bucket and even a little pretend spray bottle. These toys are played with very regularly, and he now tells me how kind it is of me to mop or hoover as I tell him this when uses his toys! He also has a toy toolbox, but isn't as keen on this since the hammer got paint marks on it when he 'helped' daddy to break something down. I would love to get Alexander a toy kitchen, unfortunately we just don't have the space for that. Puzzles and games are a hit in our household - Nathan and I enjoy them, and Alexander has joined in on that interest also. He loves to play Ker-Plunk, as well as a few of the educational games we have from Orchard Toys. Puzzle wise, we own a variety of those, with our favourite being a set of four dinosaur puzzles from Melissa & Doug. Alexander loves these ones because they are dinosaurs, and I love them for the clean up and storage method - all kept neatly in the one box with four compartments, and each individual puzzle has a different shape on the back of the pieces making it super easy to tidy away. If you were to ask me if Alexander was a crafty kid, the answer would be no. He doesn't seem to sit and enjoy crafts as a whole - we've tried many, and will continue to do so - however he does love to paint! Although more interested in painting items than a picture on paper, Alexander is happy and content to sit and paint; he has started a little art collection in his bedroom on a shelf! WHAT TOYS DO YOUR CHILDREN ENJOY? I can see the appeal of dinosaurs - I was fascinated with them after visiting The Natural History Museum in London, and I'm so keen to take Alexander there! More than welcome! I bet Alexander would love it, the Natural History Museum is great fun and so interesting. Yes, love a good jigsaw! Thank you for all of the lovely comments of late too. ...my grandchildren, both boys and girls have loved dinosaurs.